The septic tank is the component of a septic system that stores sludge and suspended solids. It also stores effluent which is the liquid part of sewage. Tanks are made of various materials including metal, concrete, fiberglass and variations of plastic including polyethylene and polypropylene. They are available in various sizes and configurations. Residential tank sizes typically range from 500 gallons up to 1500 gallons. They can be single, dual or multiple compartment tanks. I am going to cover a few differences associated with septic system tanks. At Envirotek we have extensive experience with all makes and brands. Whether it’s for installation, repair, locating or maintenance we can provide you with the right solution. The most commonly used tank is a concrete tank. Concrete offers the benefit of structural sturdiness. They can typically stand the weight of more soil above them as well as small vehicle traffic. They are usually manufactured as precast tanks. Some are one piece (particularly the smaller sizes) and some are two or more pieces. One of the detriments of concrete tanks is that sewage gases erode the tank from within (especially above the water line). No precast concrete versions we have used are water tight. They all leak at the inlet and outlet where the sewer lines connect. This is because most pre-casters use a standard plastic insert that is cut away according to the size of the pipe you are connecting. These plastic inserts do not offer a watertight connection to the pipe. Some leak around the lid. Some pre-casters build their tanks as two pieces with a bottom and a top. These tanks often leak where they are joined together. All two piece concrete tanks we have seen deteriorate where they are joined. They are often delivered to the job site with extensive honeycombs near the joints because of insufficient attention to vibration and consolidation of the concrete when they are poured at the factory. In recent years some pre-casters have begun to cast in risers in the lids. These risers provide a way to service the tank after it is buried. The risers can be located above the inlet and outlet pipe as well as the center of the tank. The risers are capped with a lid at grade. Not all concrete tanks have cast-in risers. However, risers can be added to the them. Large diameter risers provide access to the tank for pumping and servicing inlet and outlet components. Fiberglass tanks come in similar sizes and configurations as concrete tanks except they are usually cylindrical in shape. They typically do not have the load bearing capacity of concrete tanks. However, they often have waterproof connections for inlet and outlet pipes as well as waterproof built-in risers to grade. We have not seen any fiberglass tanks deteriorated from sewer gases. 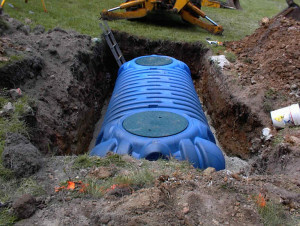 Fiberglass tanks are typically the most expensive option for septic tanks. They cost more than concrete tanks. They require careful back-filling using small gravel or sand to properly support and protect the tank when filled with water. Plastic or variations of plastic or polyethylene tanks come in similar sizes and configurations as concrete and fiberglass tanks. Most tanks of this material are rotary blow molded. The ones we have used have excellent waterproof connectors at the inlet and outlet. Poly tanks do not deteriorate from sewer gases. However, none we have used have good sturdy risers. They require special back-filling material as well. Metal tanks are basically a tank of the past. There are regulations against their use in many areas including our service areas. 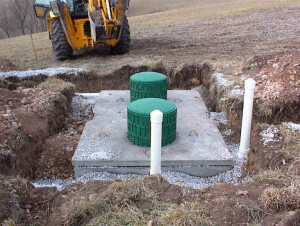 Most metal septic tanks we see have been in the ground for 10 or more years. Most are in bad condition all over. Many are in fair condition below the water line but rusted badly above the water line. In summary, concrete tanks are the most prevalent. We can make most of them watertight. We can also install additional components to help slow their deterioration from sewer gases. Fiberglass and poly tanks offer the convenience of being lightweight and easier to handle and are often a good choice particularly in areas with limited access for heavy equipment such as is needed for delivering and setting concrete tanks.